Actual Size: 6' by 6"
Drive to the red zone and pass for a touchdown with our football game. Does not require power to inflate or to stay inflated. 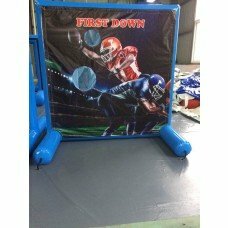 We can add a second game on the other side for an additional $10! Stands 6' tall and approx. 6' wide. Price is for 2 games. Choose among Zombie Hunt, Clown Toss, Shark Bite, First Down, Strike Zone, and Soccer Kick.